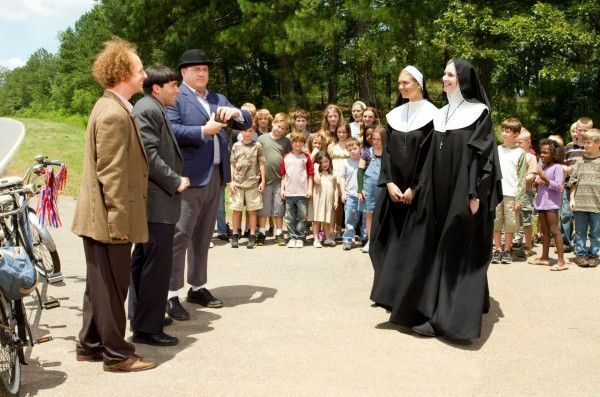 After being left on the doorstep of an orphanage run by nuns, newborns Moe, Larry and Curly grow up under the tutelage of Mother Superior (Jane Lynch), Sister Mary-Mengele (Larry David) and Sister Rosemary (Jennifer Hudson) in The Three Stooges. Now adults (and played by Chris Diamantopoulos, Sean Hayes and Will Sasso), they set out to save their childhood home, but quickly become embroiled in an oddball murder plot (at the hands of Sofia Vergara and Craig Bierko), with all of the pratfalls and slapstick comedy that they’re famous for. 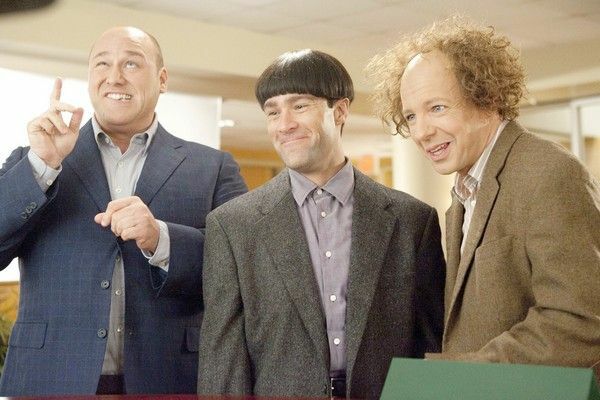 During this recent exclusive phone interview with Collider, actor Chris Diamantopoulos talked about what it was like to embody Moe, how he got the role after a four-and-a-half-month-long auditioning process, the moment when he felt like he had really found the character, his most memorable moment on set as The Stooges, how he dislocated his shoulder and broke a finger doing their various pratfalls, what made filmmakers Peter and Bobby Farrelly the right guys to bring The Three Stooges back to life, and the two hours of deleted bits that could end up on the DVD. He also talked about his role on the NBC comedy series Up All Night (starring Christina Applegate, Will Arnett and Maya Rudolph), who he plays in the heist comedy The Black Marks (with Kurt Russell and Matt Dillon), and how he would love to do a James Bond type of action-drama. Check out what he had to say after the jump. Collider: What was it like to embody Moe, every day during filming? It was so much fun, and just so amazing to see The Stooges coming back to life. It was great. We had a blast! I have an 18-month-old little boy and the only thing that calms him down in the high chair, so he can sit and eat, is The Three Stooges. I watch him watching it and I remember how I felt when I watched and then would perform the shorts for my family. The Stooges used to be ubiquitous, back in the ‘60s and ‘70s. They were on TV all the time, but they’re not on so much anymore. Kids aren’t getting the chance to watch them, not to mention the fact that kids don’t really necessarily relate to black-and-white stuff. This is an opportunity for us to give back, in the way that Moe, Larry and Curly did. They played characters. They weren’t playing themselves. We’re simply taking those characters and we’re putting them back up there. It was a real honor to do it, and just so much fun and, my god, what an insane amount of work. How did you come to be a part of the film? Did you have to go through a crazy auditioning process? So, I went, I did my audition, and they liked what I did. I asked if I could do the other scene, and they let me do the other scene, and they liked what I did. And then, over the course of four and a half months, I auditioned over 10 times, and I mourned the role a couple of times, too. People were talking about Benicio [Del Toro], they were talking about Johnny Knoxville, and they were talking about Hank Azaria – all good guys, all amazing actors, and all right for different reasons. Actors never argue why someone would be right for the role. My hat goes off to all of them for how good they are. But, I knew, deep down inside, no matter how good anyone was, as an actor, I had to play Moe. I’m not kidding. I had to play Moe. I just knew it. And, it doesn’t happen this way, but it did. I got the part. What was the moment you felt like you had really found Moe? Was it before shooting started? Was it when you got into the costume and wig? What was it that really made it click for you? DIAMANTOPOULOS: That’s a fantastic question! I videotaped myself before each audition, so that I could play it back and see how close I was to Moe. With my first audition, I remember thinking, in a cocky way, “This is it! I’ve got it! This is Moe!” But, when I look back, after the 10 auditions, and into what I actually did in the movie, thank god I had time to work on it and nuance it and figure it out. My first take on Moe was just a sketch. It was drawn in chalk. It took time. It took the understanding of every facial nuance and every physical nuance, the body, the posture, where the voice is placed on different words, different intonations, when the eyebrow is raised, how he smiles, how he laughs, how he chews, how he walks, what he would hold a utensil with, which hand he was more willing to hit someone with, how he would necessarily go about a situation. It turned into this entire lexicon of Moe-ism, and then, ultimately, it just became intrinsic. Do you have any particularly memorable moments of the three of you being on set together? DIAMANTOPOULOS: There are a slew of them. One of them that was really funny was, in our introduction in the movie, we’re sleeping together, but we didn’t really talk about it. It often happened that we wouldn’t really talk about what ended up happening, we were just all in the Stooge mode. So, we got into bed and we were doing the camera rehearsal, and I started out with a deep, low snore, Sean [Hayes] did a whistle, and Will [Sasso] made a noise. It just happened. We literally fell out of the bed laughing because it was so ludicrous that, without speaking about it, three adults knew exactly what they were doing when they laid down in bed together to do the sleeping scene. There was no stage direction. It was just really, really funny. I don’t know if I should tell you this because it’s a secret, but Sean couldn’t get the whistle the way he wanted it, and (screenwriter) Mike Cerrone, who is a Stooge fanatic, has this phenomenal whistle. If you really pay attention to the movie, it comes into play, in many different sections. So, Mike hid under the bed and would hear me snore, and he would do his whistle. It’s this phenomenal whistle that’s not even looped in. It’s actually Mike, under the bed, doing it. It’s fantastic! Did you enjoy getting to do all of these pratfalls, or did you have some unfortunate mishaps? DIAMANTOPOULOS: Yeah, I dislocated my shoulder and broke my finger. I dislocated my shoulder during a scene, and had to re-enter the scene and slap Curly. We finished, and then, that night, I went to the hospital. And, I broke my finger, trying to poke Larry in the eyes. He lifted a board in front of me and I poked the board. I was going so full-throttle that I completely snapped my finger. But, I loved it. Sean was icing his jaw, every other hour, and I was icing every part of my body. I had to ice my hands because it would hurt so much when I would slap the guys. But, it was so much fun! I was a kid in a candy store. I hope that I get to do at least 200 more features like this. In terms of other acting work, it will be fabulous. I’m not a comedian, I’m an actor. 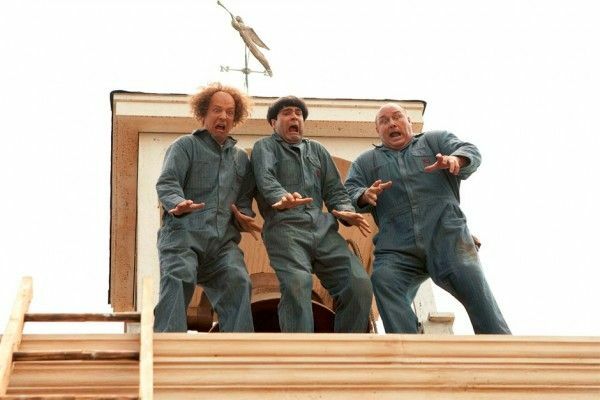 But, it’s going to be pretty hard to find something that can compare to doing Stooges, the first time out. That was something really special for me. Was it ever difficult not to crack up, working with Jane Lynch, Larry David and Jennifer Hudson in nun habits? DIAMANTOPOULOS: Larry made me laugh, almost every time he was in a scene. All of them were hilarious. Actually, Sofia [Vergara] made us laugh to the point where we couldn’t breathe, especially with the added thing of English being her second language. She is actually quite brilliant and really, really smart. I’ll never forget, someone was visiting the set and said, “So, Sofia, do you play the femme fatale in this movie?,” and her response was, “No, I’m playing a scientist.” I just thought that was so frigging awesome! She was like, “What do you think I’m playing?! Of course, I’m playing the beautiful woman!” That was pretty awesome! And, Larry David made me laugh a lot. What made me laugh the most was that he wanted to see us as Moe, Larry and Curly, so if I was in costume and talked as myself, he was like, “That’s creepy! I don’t want to see that.” And, Jane is just ridiculously funny. She plays a little bit more of a straight character in the movie, but there are a couple of lines that she does with such a real, honest delivery that they’re just unbelievably funny. She’s really, really good. Are there a lot of deleted scenes and extras that could end up on the DVD? DIAMANTOPOULOS: I don’t know, maybe two hours worth. There were so many bits that we came up with, that the movie just didn’t have time for. I’m actually sad. When I saw the film, I loved the film, but there are those things that you fall in love with when you’re shooting them. There are entire homages to bits that The Stooges did, almost physically verbatim, that we weren’t able to put in the movie. Hopefully, those will end up on the DVD. 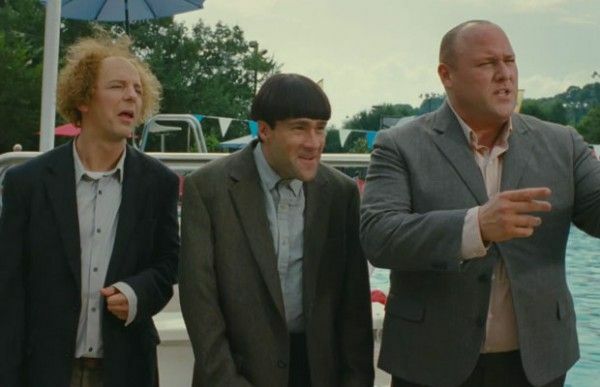 What do you think made Peter and Bobby Farrelly the right guys to bring The Three Stooges back to life? DIAMANTOPOULOS: They’re such cool guys. I’ve never met a director like either of them. The best way I can describe them is that they’re like the nicest soccer coaches you’ve ever met. They’re both sincere, sweet guys, who really want everybody to be comfortable, feel good, be happy and have a great time, on a personal level. Their set is run like a family. On a professional level, I didn’t think I could meet two guys that loved The Stooges as much as I did, and cared as much about The Stooges as I did. When I met them and they started talking about what The Stooges meant to them and their childhood, I knew that the movie was in the right hands. Of course, I’ve been a fan of their work, so I knew that, from a technical perspective, the movie would be in the right hands because the guys are gifted comic directors. But, from the perspective that this subject matter is near and dear to millions upon millions of people, around the world, I knew we were in good hands. Do you have any idea what you’re going to do next? DIAMANTOPOULOS: I have this great part on this NBC show, called Up All Night, with Maya Rudolph, Will Arnett and Christina Applegate. I love the character. His name is Julian, and he’s Maya Rudolph’s character’s Armenia nightclub owner, douchebag boyfriend. It started out as a one-off, and I ended up doing five episodes. The last episode may well be one of the funniest things I’ve shot on TV, in a long time. I’ve been having a blast doing that. I also just shot this really cool feature with Kurt Russell, Matt Dillon and Terence Stamp. I play a Parisian art forger. It’s a heist comedy, called The Black Marks. 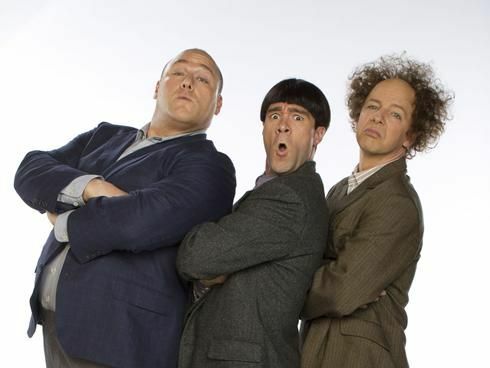 Do you have a dream role, aside from The Three Stooges, that you’d love to do, if given the chance? DIAMANTOPOULOS: If I could rub a genie and anything could happen? Truthfully, my other love, and this is a complete 180, but I’d love to do a spy or an espionage pic, like a James Bond movie. I’m a huge fan of the James Bond genre. I would love to do something like that, that’s a non-comedic, action-drama.